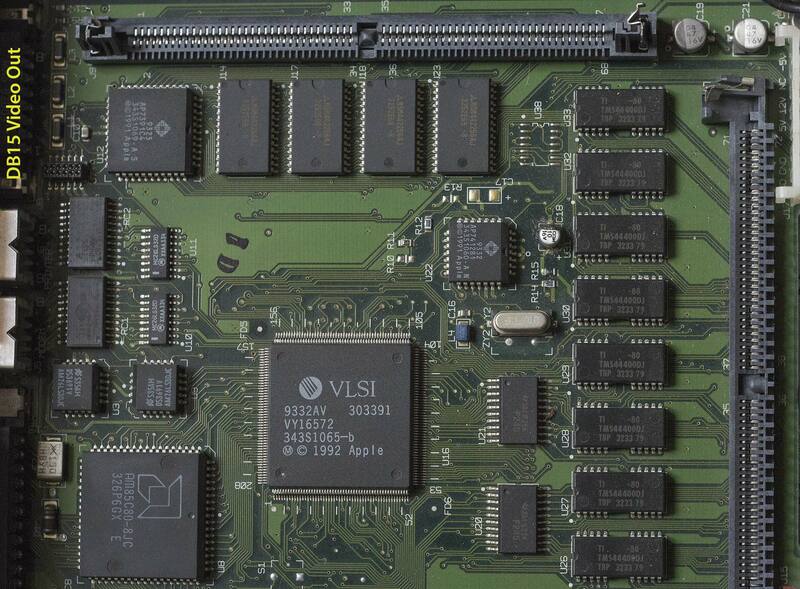 Apple chipset from Macintosh LC III. Graphics chipset from Apple Macintosh LC III computer (1993). Could be used also on other models (1991 date on chips). Looking for following info: which chip is RAMDAC and main graphics chipset? Bigger 343S1069 near DB-15 video out or smaller 343S1060 near memory?. Chips are probably made by Sierra. 343S1069 appears to be the CLUT/DAC (it's otherwise unnamed on the developer's note), and 343S1060 is "Omega", a clock generator chip. The graphics controller itself is built into the large "Sonora" LSI in the middle of the board.